The summer of that year was a time of passionate and animated political campaigning for the Democrats and the Whigs. There’s already been one altercation between devoted Whig Jacob Early, the Springfield land office registrar, and Henry Truett, running against him for the Democrats, a confrontation witnessed by everyone in Colonel Spotswood’s Rural Hotel, including Abraham Lincoln and his roommate, Joshua Fry Speed. Political diversity hits home when Speed’s sister, Martha, decides to campaign for Stephen Douglas, as have many of the women of Springfield. Speed definitely doesn’t want Douglas to win, and he isn’t too wild about the way Martha looks at the candidate and vice versa. Things go from bad to worse when Ninian Edwards, former state’s attorney general, invites the townsfolk to a July 4th celebration at his home. All the local politicians are invited, but no speeches are to be made. Instead, everyone is to enjoy the observation of the nation’s Independence Day and a fireworks exhibition Edwards has arranged. The pyrotechnic display is loud and dazzling. At one point, it’s almost like a barrage of actual gunfire, only prettier. It’s during the final volley of rockets that the unbelievable happens. Someone shoots Jacob Early as he stands beside Speed. It doesn’t take long for someone to remember Early and Truett’s altercation at Spotswood’s, and soon an accusation of murder is leveled at Truett. When he’s arrested, no one is more surprised than Lincoln that the accused wishes to hire him as his defense attorney. Worse yet, the prosecuting lawyer is none other than Stephen Douglas. Now Abraham and Speed must prove that the man running for the “other side” is not guilty of murdering his opponent. Complicating things is the fact that Abe’s father and stepbrother have suddenly shown up. Other than embarrassing him with reminiscences of misadventures from his boyhood and bringing back memories of his recently deceased beloved Ann Rutledge, Abe is certain his father has some scheme he plans to use to con the townsfolk out of their hard-earned money. He isn’t certain exactly how they’ll do it, but he’s sure it’ll cause him more awkwardness. Abe has never truly gotten over Ann’s death and is just now beginning to make cautious advances to one of the young ladies of the town, Margaret Owens, sister of the local apothecary. When it’s discovered Early was facing away from the fireworks when he was shot, this is deemed a significant fact. What would make a man look away from the first fireworks display he’d ever seen? Lincoln decides to get the bullet killing Early and compare it to those in Truett’s pistol. Delving into the causes and finding out the facts will put both him and Speed in danger more times than not. Association of others with Lincoln will also bring about loss of life when Margaret Owens is also killed, this time by poisoning. What do these seemingly unrelated events have in any way to do with the murder of Jacob Early? Lincoln believes they are somehow all connected. Some of the answers may lie somewhere in Ann Rutledge’s relationship to Abraham while others are to be found in New Salem, a near-abandoned mill town not far from Springfield where Speed and Lincoln will travel in their quest for justice. The settings and descriptions in this story show the author’s love of history and his ability to make facts as entertaining as fiction. The courtroom scenes will be of particular interest for they are a showcase for Lincoln’s quick but homespun wit, whether it’s in selecting the jury or defending his client. Most of the general public’s knowledge about Lincoln is of his years in the White House. Final Resting Place gives us a view of the Great Emancipator before that time, at the beginning of his political career. Jonathan Putnam’s Lincoln comes alive as a man suffering a deep loss while attempting to carry on with his life. He’s a very human character, embarrassed by his relatives, determined to give the best to his client in spite of their divergent political views, and concerned with the welfare of the people he considers his friends. 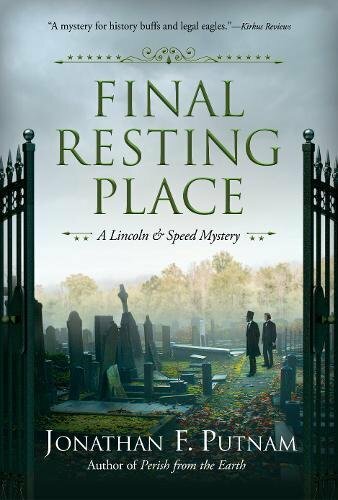 Final Resting Place is the third entry in the Lincoln and Speed series, and it’s one in which author Putnam’s competence as a Lincoln scholar is well in evidence. For those who like novels involving actual persons, this novel is highly recommended.